Garbage is one of the most pervasive elements of our contemporary society. The world currently generates about four billion tonnes of waste per year, sustaining a $433 billion industry which discards, transforms, and moves it around. Nonetheless, garbage has all too readily been consigned to the intellectual dustbin of social thought. It is worth recovering for theoretical and practical reasons. Theoretically, as a ‘mundane’ problem considered undeserving of attention within mainstream scholarship, post-consumption waste embodies the dangerous hierarchization of international phenomena over the “sub-politicized” everyday (to use Ulrich Beck’s phrase). Practically, garbage and its politics also remain largely ‘black-boxed’ out of sight, silently flowing in and out of our households, neighborhoods, cities, and countries, leaving social science with precious little to say about an industry integral to urban employment and critical to human habitation. One way of recovering garbage intellectually is through the notion of the ‘assemblage’. This refers to the way that the parts of a volatile but identifiable system relate to one another and hang together. These relations, which encompass human and non-human interactions where ‘things’ can act too, thus embraces the cosmopolitical perspective of philosopher Isabelle Stenger. Assemblage thinking thus encourages attention to the materiality of waste itself, including its unpredictable effects such as incubating the spread of disease or spontaneously exploding, but also more generally in accounting for matter as a participant shaping the way we conceive of our socio-technical world. Bins, discarded plastic bottles, landfills and masses of recycled material floating on ships across oceans become in this sense active elements of the geopolitical scenario – not just background to the actions of humanity. In short: matter matters. But by the same token, waste is more than just ‘what’s in the bin’. Waste assemblages bring materials together with norms and social structures across different spatial scales, from the waste management planning of global metropolises to the ‘domestication’ of political processes within the home. Sydney is a city that has received international attention for its innovative take on waste management and put much emphasis on promoting links between garbage and climate change. If we look into the average Sydneysider domestic recycling bin, we are likely to see conspicuous quantities of paper, plastics, and glass, but also small percentages of garden organics and, more importantly, the contamination of recyclable waste by food and putrescible material, as well as occasional quantities of dangerous waste such as electronics or batteries. This is a common place to start in discussions about garbage, and directs attention to the individual ‘deviancy’ evident in routinized practices of wasting. Yet, to unpack the everyday politics of waste, we need see this in the context of the multi-scalar assemblage. The focus of Australian state and municipal authorities has progressively shifted onto the ‘inner’ management of waste in the domestic sphere. Waste management in the home has been the object of a progressive rationalization of environmental action geared toward modifying consumption and discard behaviors, by strategies such as expanding the variety of bins made available to households and asking householders to sort and clean recyclable material. City dwellers are invested with substantial responsibilities in the correct and effective management of waste at home, which hold a crucial place in the supposed green revolution in garbage governance. For instance, wastepaper is the fifth largest containerized commodity group exported off the shores of Sydney, with China as a major destination. 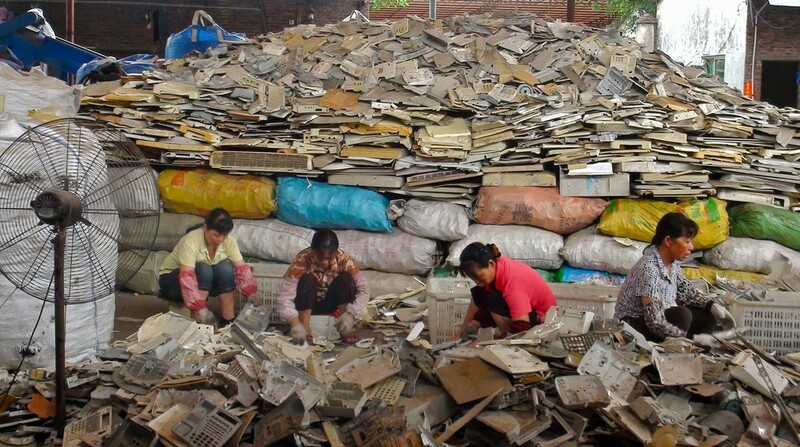 Yet in 2017 China banned the import of ‘unsorted paper’ for recycling, citing the environmental and health risks caused by this and other contaminated solid waste. Waste practices in the household have, in this sense, become key to the production of an environmental citizenship necessary to govern sustainable development in an age of liberal environmentalism and financial constraints. At home, we are entrusted by national authorities, local governments, and even the global audience of Rio+20 diplomats, to ‘do our bit’ for global sustainability. Home becomes a site for urban, as much as international, revolutions. In Sydney, the City Council has generally been ahead of the federal government in co-opting waste management for climate and sustainability purposes. Conspicuous in the present Sydney landscape is the Council’s effort to publicize the idea of zero waste. This is an approach to garbage geared toward reorganizing resource lifecycles so to avoid the disposal of materials in landfill, instead promoting reuse, recycling, and a decreased need for raw materials. The city has not only recast the dweller’s relation with waste disposal and appropriate recycling practices but also the role of the wider waste management system as a key participant in the city’s effort to maintain Sydney’s reputation as a beautiful place to live and visit. In this way the Council has also become embedded in global environmental governance, being members of the C40 Cities Climate Leadership Group and publicly praised by its former Chair and New York mayor, Michael Bloomberg, who has held up the Australian metropolis as an example of a strategic and integrated approach to waste as a climate issue. Rather than ‘trash’, garbage is being reassembled in the management of Sydney’s resources as a powerful ‘asset’ for energy generation and transnational climate action. Yet governing garbage is no easy task and even coercive mechanisms can fall short. This is the case with those attempts to institute a ‘real time audit’ of household waste that, in Sydney, as well as several other countries such as Singapore, have been proposed to identify contamination in the recycling process at the source by having garbage collectors inspect household bins. Capable of issuing contamination notices, ‘last warning’ tickets, and in some cases refusing to pick up the bin or even issuing an on-the-spot fine, these delegated powers have in practice seen very limited application. One reason in Sydney is that waste collection is largely undertaken by multinational companies, raising the problem of allowing their private-sector employees to police Australian citizens. Nor is the assignation of matter as garbage self-evidential. Some urban dwellers choose to revalue would-be waste as second-hand and in a sense re-commodify it. 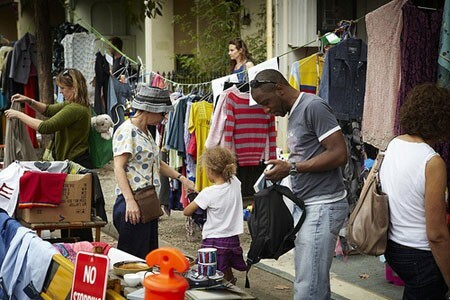 In 2010, a small group of residents from the famed beachfront neighborhood of Bondi promoted a ‘garage sale trail’ that extended for 126 households over a single day, moving an estimated 15 shipping containers worth of unwanted items and making average profits of $750 per sale. Inspired by this do-it-yourself solution, the City Council sought to match the pop-up spirit of Sydneysiders with environmental commitments to double the amount of municipal waste diverted from landfill toward recovery, promoting the garage sale trail as a civic activity across other suburbs of Sydney. 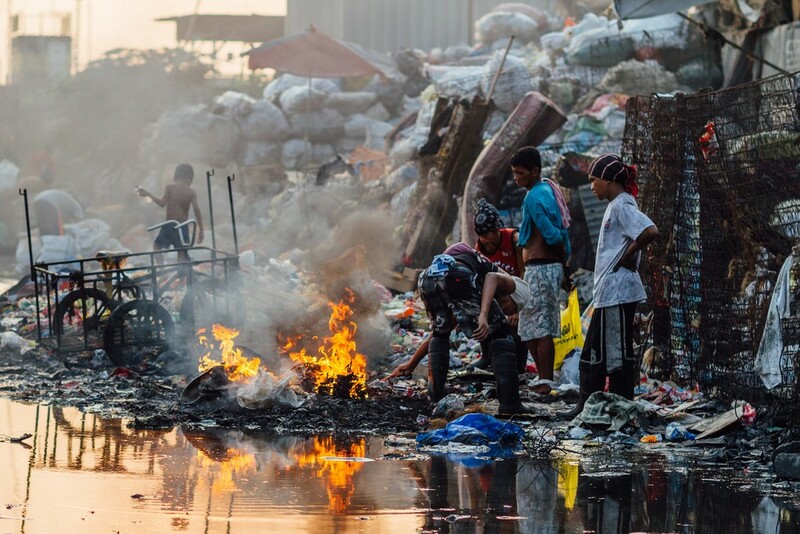 In mega-cities in the Global South, ‘informal sector recyclers’ – sometimes referred to as scavengers or waste pickers – can play a similar role in managing waste, albeit in very different, often more dangerous circumstances. As the geographer Sarah Moore argues, changing notions of what waste is, and how it ‘works’ underlie “attempts to revalue and reassess the political potential of waste as a material part of everyday life”. Different concepts of waste bring different visions of the social, economic, and environmental role of the everyday and its (critical) place in the spatiality of the international. The individual gets recast through alternative political guises and, in turn, the broader political spaces of home, city, state, and ultimately international are re-imagined and re-performed through changing mundane matters. As illustrated above, these processes require not only compliance on behalf of dwellers, but also the development of new rules and habits around very familiar gestures such as that of taking out the trash. As Emma Power has argued, domestication “is not a finished or stable relation, but must be continuously negotiated and held in place”. Just as humans discipline animals to produce them as domestic pets, similar practices of homemaking also extend to wider varieties of actants (such as objects, rules, or policies, which are actively shaping our everyday lives) which are ‘brought’ into the dwelling and made co-habitants in everyday experiences. Through assemblage thinking, the everyday thus becomes a ‘signifier’ for the abstract structures of international politics and the world economy. Moreover, the individual dweller, frequently little more than an insignificant statistical unit within analyses of these structures, is reconceptualised as a (often savvy) domesticator of grand designs, which take material place in seemingly mundane contact points. By attending to the menial journeys of garbage from kitchen storage to the recycling bin and out into the networks of waste management, resource recovery, international markets, and global disposal, we can also better understand how ‘things’ become ‘flows’ in society and thus how assemblages are re-regulated and re-politicized at larger scales – from transnational campaigns to prevent oceans being polluted with plastics to the periodic outcries over the (il)legal trade in hazardous waste. Everyday politics are, therefore, not second-class politics, but rather world politics at a scale other than the international. Acuto, M. (2014) ‘Everyday International Relations: Garbage, Grand Designs, and Mundane Matters’, International Political Sociology, 8: 4, pp. 345-362. Crane, N. J. (2012) ‘Are ‘Other Spaces’ Necessary? Associate Power at the Dumpster‘, ACME, 11: 3, pp. 352-372. Moore, S. (2012) ‘Garbage Matters’, Progress in Human Geography, 36: 6, pp. 780-799. O’Neill, K. (2001) ‘The Changing Nature of Global Waste Management for the 21st Century: A Mixed Blessing?’ Global Environmental Politics 1 (1): 77–98.